The Simms Men’s G3 Guide Gore-Tex Rain Jacketis a men’s rain jacket that is constructed with the technologically advanced and very innovative 3-layer Gore-Tex Shell fabric and a 100 percent nylon 70 denier rip-stop face with a tricot backer. This G3 Guide jacket is designed specifically to handle very tough weather conditions and to keep you dry while you are fishing, hiking, or enjoying the outdoors during extreme weather conditions or just cool weather. The Simms Men’s G3 Guide Gore-Tex Rain Jacket comes designed with 7 storage pockets that includes 2 top-load chest pockets, 2 zippered chest pockets, 1 internal stash pocket and 2 zippered micro-fleece lined hand warmer pockets, plenty of space for your valuables and fishing gear that you will need during your outdoor adventures. The Simms G3 Guide Gore-Tex Rain Jacket for men also comes with a water-resistant Dry Cuff that is designed to keep water out of the sleeves, just one more great quality of this incredible Simms rain jacket for men, a Gore-Tex jacket that stands above and way beyond that offers men a rain jacket that is by far one of the best and most desirable men’s rain jackets on the market today. 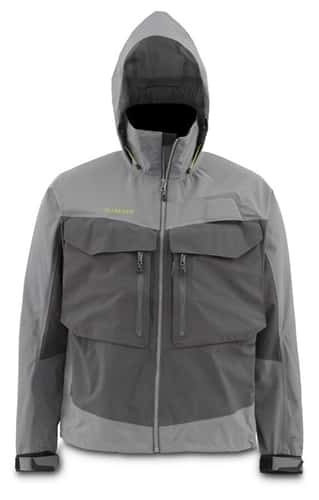 The Simms G3 Guide Jacket for men also comes stocked with a tuck-away, 3-point adjustable storm hood and a dual draw-cord adjustable bottom hem so you make sure to stay nice and warm during your fishing adventures while this extremely innovative, nice and warm men’s rain jacket by Simms. 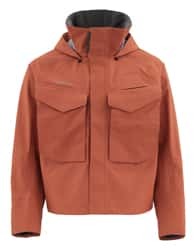 This Simms G3 Guide Gore-Tex Fishing Rain Jacket - Men's is comfortable and stylish and really great for fly-fishing. I really love it because it's made and designed so great. It's a real pleasure hitting my local stream wearing my new Simms Men's G3 Guide Gore-Tex Fishing Rain Jacket.